As he stood, oblivious, with his pile of books tucked under one arm, his tattered messenger bag knocked over his soda. All over my papers. Did he turn around and clean it up? Oh no. Leave it to good ole Rochelle. I was tempted to run and leave it for a librarian, but my mama would roll over in her grave, if she were dead. But no, I stayed, and endured the disappointed looks she threw me. I don't think she believed me. The first 100 signs are based on usage frequency in normal, everyday conversations. Some words were removed based on the usage of ASL. For instance, there is no a/an word that we sign. The 13+ words removed were replaced with high frequency signs. In no way is this list ALL the signs you need to know. It's the beginning. You've got to keep going. This list establishes a foundation that you can always rely on when you're signing with your new Deaf friends. These are the first 100 signs you should know, and you know I don't like using the word should (hailing back to my job in a wilderness therapy program). You're should-ing all over me. But for reals, you should know these signs. If you are a student in any of my courses you've heard and seen me explaining what know means. Know does not equal seeing the sign a few times and sorta recognizing it if you squint real hard on a Tuesday and spin around 3 times on your left leg. It means you recognize the sign within 3 seconds of it being signed to you. It means you can sign the word within 3 seconds of seeing/hearing/reading the English word. 3 seconds, folks. 3 seconds. Not any more than 3 seconds. I'm not talking about those 3 seconds that some parents count off to their misbehaving child. 1.... 2.... 2 1/4... 2 1/2.... 2 3/5... 2 3/4.... I'm almost to 3.... I'm almost to 3..... 2 4/5.... thththththth (eyes darting around for help).......3?.... 3! This is how you count: 1 and 2 and 3. Bam. Done. There's no penalty for faster than 3 seconds. 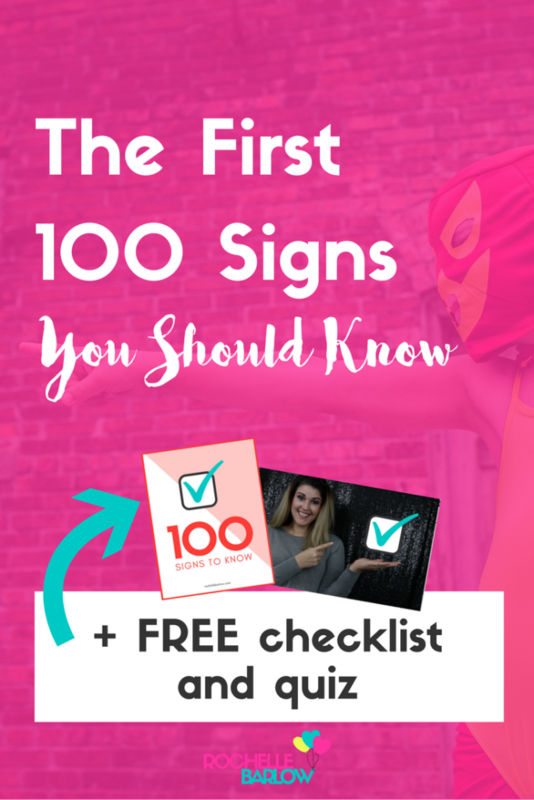 I created a checklist for you to be able to see all 100 signs on one page, and check check check all the signs you know, know. Bonus: you get access to the receptive video to check your skills. Because, hello, it's cheating if you know which sign is coming next. Did you know many of the signs? If you think you know all 100, be sure to download the checklist-- this will give you access to the receptive video quiz. This is the real test. I'm not going to be nice and sign the sign 3 times each, slowly. Now now, mop the sweat off your glistening brow. Good, it was getting a bit musty in here. I'm not going to be so fast your eyes start bleeding. I'm not going to be so fast that you miss a sign if you blink. I'm not going to be so fast that you'll fail because I'm evil and it makes me feel better if no one but me can sign (I had a few professors like that). This is going to be realistic, friendly speed. That means, real conversation speed with an intermediate signer. Not fresh out of the first day of ASL class signer. But not, I'm a professional interpreter for court proceedings fast. I didn't think I could go on and on this much about speed. I'm channeling my inner Jim Gaffigan with his bacon jokes. I won't give you a grade at the end of the test. You'll give yourself a grade. You'll also get to have fun checking off all those signs on your checklist.